John A. Burns School of Medicine alumnus and Professor of Family Medicine and Community Health Dr. Neal Palafox is a true champion. He has been selected to receive C-Change’s 2014 Comprehensive Cancer Control (CCC) Champion Award. The CCC Champion Award recognizes volunteer CCC coalition members who go above and beyond the call of duty to advance projects or interventions consistent with priorities in their coalition’s respective CCC plan. 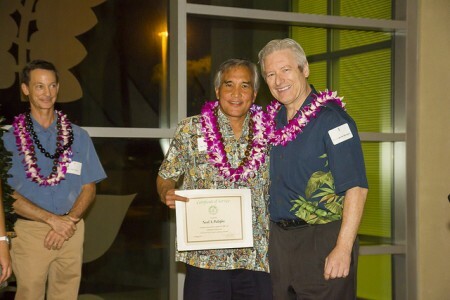 Dr. Palafox, Dean Jerris Hedges and Dr. Allen “Chip” Hixon at a celebration of Family Medicine’s 20th anniversary at UH, in Oct. 2013. From 1998 to 2008, Dr. Palafox was principal investigator examining the health effects of the U.S. nuclear weapons testing program in the Marshall Islands, focusing on the lingering health impacts from nuclear tests conducted in the Pacific during the World War Two era. In 1999 and again in 2010, Dr. Palafox was invited to testify in Washington, D.C. before the President’s Cancer Panel on cancer-related challenges in the US Associated Pacific. He is a recipient of the Leonard Tow Humanism in Medicine Award. In 2011, Dr. Palafox was granted the rare honor full citizenship to the Republic of the Marshall Islands (RMI) in recognition of his 28 years of health work in the Marshall Islands and the Pacific. The Comprehensive Cancer Control “Cancer Champion” award was presented to Dr. Palafox during C-Change’s 2014 Annual Meeting May 15th & 16th in Raleigh, North Carolina. Founded in 1998, C-Change is an innovator in the advancement of cancer issues, serving as a convener, a forum and a catalyst for identifying problems and major challenges facing the cancer community and for initiating collaborative actions. Membership is comprised of key cancer leaders from the three sectors — private, public, and not-for-profit — and from across the cancer continuum — prevention, early detection, treatment and quality of life. Nearly 12 years ago, President George H. W. Bush and Barbara Bush helped create C-Change, then known as the National Dialogue on Cancer. For well over a decade they have co-chaired this unique nonprofit organization, dedicated to eliminating cancer as a major public health burden at the earliest possible time. Their steadfast leadership and power to convene cancer leaders from the private, public, and nonprofit sectors continues to work effectively today to foster dialogue and collaborative action across the wide spectrum of cancer issues. Read our Question and Answer “Faculty Spotlight” about Dr. Palafox from May 2013. 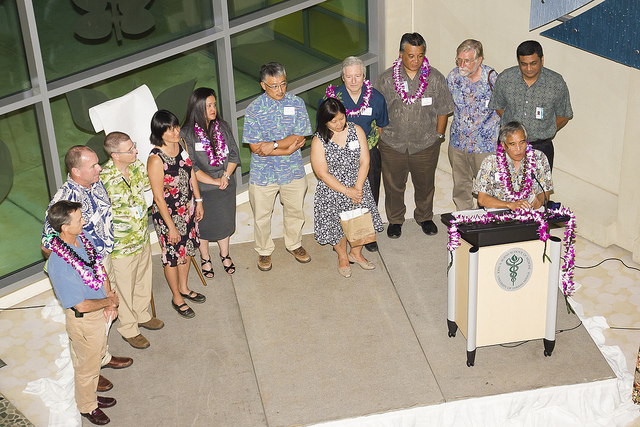 In our main photo, Dr. Palafox is surrounded by others who have chaired Family Medicine or been part of the department’s leadership. Oct. 2013 at JABSOM.